Okay, let's get into the nitty gritty with Far Cry 5 here. There's been enough time since the game's release that I feel safe discussing story particulars here. If you still aren't interested in spoilers, this is the only warning you'll get. There is something that I think bears discussion beyond the simple "was it good or bad" argument that everyone seems to focus on. I want to talk about what the game's tone, structure and message do for the ending, what the ending does for those elements and whether or not the effect of the game's narrative arch was intentional and, if so, was it effective? So let's dive in. At the end of the game the player is presented with one of two options. They can walk away, taking their friends with them only to red out in the truck, triggered by a song played over the radio or they can stay ad fight Joseph Seed, a fight that ultimately ends with the player and compatriots fleeing to a bunker with Joseph in tow to avoid the nuclear fallout from the numerous bombs exploding around them. Neither of these is a particularly attractive option. In scenario A, you presumably kill everyone you've gotten to know over the course of the game and Joseph is left to continue running his cult, free of the player's interference. In scenario B the player is left alone with Joseph, both safely locked in a bunker while the world burns outside. In either case, it is arguable to say that really in the end, the cult has won, though in the case of scenario B, I would say that the result is simply that they were right. Even that statement though, "the cult was right" comes with caveats in my mind; they were right about the impending doom of mankind, not about the injudicious killing and mayhem they wrought in the time leading up the that moment and really none of their ideology or practises are close to anything most people would consider right or good. This is something that I feel fairly certain that the developers understood from the start. I don't think it bears any sense to rant on Youtube or any place else about how awful it is that the developers of Far Cry 5 were blithely sending a message that it is better to just leave the crazies and the bigots alone or we'll all end up dead. I think that the game worked very hard not to say that, in fact, I would argue that the narrative is structured in such a way that it attempts to remain neutral throughout the narrative. I think the goal was more to hold a mirror to the players and ask them what they thought of the situation on the whole, to provoke the players to question their role and what the best course of action might have actually looked like. I feel that Far Cry 5 started off trying to send a very specific message; one that spoke out about racism and bigotry, cult-like ideologies and the danger of dogmatic beliefs taught by a charismatic figure. However, I think it likely that before long, the publisher stepped in, telling them to reign it in so as not to cause a fuss in the politically charged climate of the industry at the moment. In following these marching orders, I think there was a choice made to promote a more neutral story, so as to leave the players and the community to draw their own conclusions and discuss the serious and real issues within the relatively safe context of the game. If this was the case, then I commend them for the attempt. Unfortunately, I have no way to verify this thought, but as a designer, I think I would have tried to find a way for my players to have the same discussions about the game I made, regardless of the instructions from the publisher. Now the question remains, was this an effective approach. Sadly, i would argue that it wasn't. Most of the players of the game seem to stay hung up on the idea that the time they invested in the game, that characters they met, weapons, vehicles and buddies they unlocked, side missions and stunts they completed are essentially burned away in the end of the game, no matter which choice you make. It feels like it comes out of the blue and simply tells you that nothing you did meant anything. 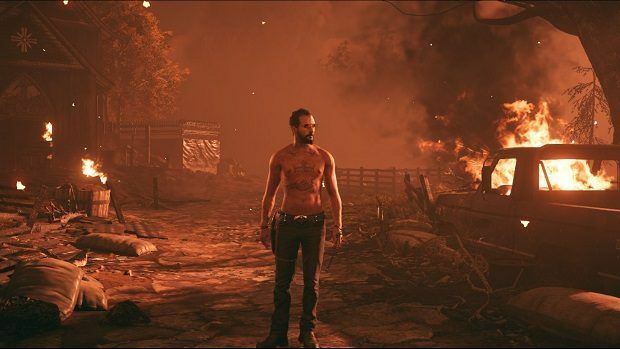 What's worse, it seems to take it all back after the credits roll, placing the player back in Hope County minus the death and destruction, leaving the average player even more bewildered. After a lot of thought and deliberation, I think I've landed on my opinion of the ending of Far Cry 5. I see what it was (possibly) going for and I certainly appreciate the work that was put into it, but I have to say that the execution of that ending felt flawed. It isn't enough to give the player brief, tattered warnings about the chaos enveloping the world through an object whose level of interactivity is not controlled by the game's narrative structure. To say that a player wasn't paying attention to the game world because they missed four, minute long radio segments detailing worsening conditions in the outside world during roughly 30 hours of gameplay is unfair. I agree that a player shouldn't be spoon-fed most things, and that emergent discovery of narrative is sublime and fascinating to a player, but in the case of an element that will drastically alter the outcome of the game, a few more obvious hints at least would have gone a long way towards giving the players enough knowledge to pick up the thread and at least understand how things got there. Now aside from the ending, there is the issue of the game's neutrality in the face of heinous and terrible acts of violence and hate committed by the game's antagonists. If we assume that the neutral stance was intentional, is it okay that the developers didn't take a side? Is it the responsibility of the developer to choose a side and represent their beliefs faithfully within the games they make? In the case of a large franchise game, should the game's creators be expected to push one set of beliefs over another? Is it enough to simply try and provoke conversation among the players and let each one come to his/her own conclusion? This is not a question that I can answer in a broad sense. I know what I feel is important to me as a designer, but each one of us is entirely different and our goals, beliefs, concepts and methods often do not line up. This question of the requirement of intent is up to each individual and should never be decided by any other entity, be they fan, publisher, fellow designer or political system.